Featured speakers Eric Metaxas, Allie Stuckey, Bob Lenz and Victoria Robinson, musical guest Steven Curtis Chapman, with special guests, Fox Nation Contributors Diamond and Silk, Recording Artists Joy Villa and Matt Hammitt, Students for Life, Pregnancy Resource Centers, and many others. 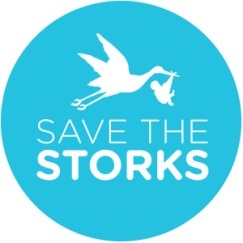 NASHVILLE, Jan. 14, 2019 /Christian Newswire/ -- Save the Storks, a pro-life organization partnering with pregnancy resource centers to empower women through education with choice during pregnancy, will be hosting their premier black-tie fundraising gala, the Stork Charity Ball, on January 17, 2019 in Washington D.C. Together, guests will dine and celebrate the 5000+ lives that have been saved on mobile medical units, also known as Stork Buses. Save the Storks Founder and CEO Joe Baker will share the organization's 2019/2020 vision for empowering passionate, pro-life Americans with measurable, quantifiable, and easily-accessible ways to make an unlimited immediate impact on would-be mothers and their babies' lives. This year's nearly sold-out ball will be co-hosted by Kirk and Chelsea Cameron. Grammy Award® winning artist Steven Curtis Chapman will be the musical guest. Speakers include best-selling author and syndicated radio show host Eric Metaxas, the "conservative millennial" blogger and Fox News guest Allie Stuckey, Life Promotions founder Bob Lenz and Save the Storks Director of External Relations and Lifetime Television star Victoria Robinson. Special guests include Fox Nation contributors Diamond and Silk, recording artists Joy Villa and Matt Hammitt, Students for Life, Pregnancy Resource Centers, and many others. Save the Storks' mission is to revolutionize the meaning of pro-life. This organization partners with pregnancy resource centers in the United States to empower women with choice during pregnancy. Save the Storks has captured the imagination of millions with their compelling Heartbeat and Father's Day videos and with its innovative fleet of Mercedes-Benz Mobile Medical Units, known as the Stork Bus. To date, Save the Storks has built 47 buses, with three additional Stork Buses in production and nine in fundraising.